For the folks in the States, the editions are harder to come by. Pyr initially published them, and I’m still having rights issues with them. If you can’t find a copy of these first three novels, try the Diving Bundle, which contains many of the novellas that later comprised the volumes. You’ll miss a few parts to the story, plus get a few things that weren’t in the first three novels, but you’ll have a sense of where we are. So, let me share the back cover copy with you, and then we’ll get to the excerpt and ordering information for Skirmishes. I hope you look for the novel–and even more importantly, I hope you enjoy it when you find it. The answers Captain Jonathon “Coop” Cooper and the crew of the Ivoire seek lie in the Boneyards. But they must wait for Boss and her team to dive it, explore the wrecks, and piece together what happened in that faraway place. Boss loves the challenge. Thousands of ships, centuries of history, all play to her strengths. In her absence, she trusts Coop to defend the Nine Planets Alliance against the Enterran Empire. Captain Jonathon “Coop” Cooper sank into the command chair on the Ivoire, and tapped the right-hand controls. “Let me see that screen again,” he said to Mavis Kravchenko, his first officer. She was a large woman whose size came from being raised in the real gravity of one of the Fleet’s land-based sector bases. Sometimes Coop thought she was as solid as the ground she was raised on. Kravchenko worked two different consoles. She preferred to stand as her hands flew back and forth between them. Right now, everyone on the bridge focused on Kravchenko, even though they pretended not to. Coop had a full crew running the Ivoire—or, at least, as full a crew as he could manage with half of his most experienced crew on the Shadow. His former second officer, Lynda Rooney, had taken her favorite people with her when he promoted her to command the Shadow, which was the only other functional Fleet ship in this sector. Hell, the only other functional Fleet ship in this entire universe for all he knew. He tried to keep thoughts like that out of his head. Even though he’d been here for more than five years now, the change in his circumstances still surprised him. “You got the screen, Captain?” Kravchenko asked, using a tone that made him realize she’d asked him at least once before. He tapped one more control. A holoimage of the sensor console rose in front of him. Kravchenko was running it in infrared rather than a normal visual spectrum. That didn’t bother him. For this, infrared was probably better. “I got it,” he said, and peered at the information before him. Images, trails, gigantic circles, all of which would mean nothing to the untrained eye. But Coop saw energy signatures, populated planets, and faraway stars. He layered heat signatures and energy readings onto the screen, then he opened a second holographic screen with the standard visual images of the same section of space. On the visual, he could see the stars but not the energy or heat signatures. He also couldn’t see what had caused those signatures. On the layered infrared screen, he saw a dozen Enterran Empire vessels spreading out in one of their typical search patterns. Cloaked ships. The Empire’s cloaks were primitive, but effective. He had to actively search for them—and they certainly weren’t visible to the naked eye. He felt a familiar frustration. In the past, he could have easily handled a situation like this. His experience gave him a dozen different ways to deal with an aggressive space-faring culture like the Empire. Except his experience and his training no longer applied. Now he had to be creative. Now he had to think like a smart man in a room full of children. That wasn’t fair, of course. The cultures here had a lot of smart people. They just lacked the knowledge he had and the technology he was used to. Six years ago, he’d been a captain among many, part of a Fleet that went from sector to sector, never back where it had been. He had been one man in thousands, living a life spread across hundreds of ships, several star bases, and at least two sector bases at one time. He had superiors and subordinates, family here and on other ships, friendships that had spanned decades. Now he had less than five hundred people who had gone through the same dislocation that he had. None of them were his superiors, all were his subordinates, and none were blood relatives. The only person with whom he had any personal history at all was his ex-wife Mae, who had become a friend. He had a new life here in what had once been an unimaginable future, and by many counts, it was a good life. But sometimes the changes overwhelmed him. Like right now. He needed at least twenty other Fleet ships, outfitted with the latest (Latest? The word made him smile to himself) sensor technology. He wanted to set up a full sensor blanket, so that nothing could cross the border from the Enterran Empire into the Nine Planets Alliance without him knowing. But he only had two fully-equipped Fleet ships, and twenty more vessels, most of which he wouldn’t even dignify with the word “ship.” They were everything from the Nobody’s Business, which was old, creaky, and designed for fewer than fifty passengers, to what passed for warships on Cros’ll, the nearest of the Nine Planets to the border. Those ships were so badly designed that Coop was afraid one shot out of their weapons array might explode the ship and everything around it. He felt like he was leading a squadron of two ships and a bunch of working ship models. Most of the ships around him wouldn’t even have qualified as entries in the ship-building contest that the Fleet once ran every few years for its engineering students. But Coop couldn’t tell any of the so-called captains that. Just like he couldn’t tell them how he had acquired his own training. Any sentence that began with “Five thousand years ago….” was guaranteed to cause the disbelief to begin. What he needed at the moment was a sensor blanket, dozens of scout ships, and some intel from inside the Empire. But he had no intel that he could trust, a few scout ships that he couldn’t spare, and no way to blanket anything with any kind of sensor, let alone block entrance into this region of space. Kravchenko was doing her best. She had been actively searching for Empire ships. But she wasn’t searching alone. He had most of the engineering crew monitoring the border. If he couldn’t use ships to set up a sensor blanket, he would have his own people do it as best they could. The rest of the bridge crew monitored their stations, apparently trying (and sometimes failing) not to glance at what they could see of Coop’s screens. “How long have the ships been there?” he asked Kravchenko. An hour. He didn’t believe that. He wondered if the ships wanted to be seen. After all, it was better for the Empire if the Nine Planets’ ships crossed the border into Enterran space. Then the Nine Planets would have invaded the Empire, not the other way around. But his rag-tag army had instructions not to fire first or to cross that border ever. He had instructed all of the so-called captains to make sure they gave the Empire absolutely no reason to invade the Nine Planets. If the Enterran Empire wanted to attack the Nine Planets Alliance and ruin more than a century of what could only charitably be called peace, then it could. And it would destroy untold amounts of property, as well as millions of lives. The Empire probably wouldn’t win against the Nine Planets—the Empire had never won against the Nine Planets—but the Empire would make life here miserable, which Coop wasn’t willing to let happen. He had promised Boss that he would guard the borders to the Nine Planets, and that was what he planned to do. Boss. She was an interesting woman. She had been the first person he’d seen in this new time period, wearing what, he thought at the time, was an ancient and outdated space suit. He later learned so much technology had been lost that his people seemed amazingly advanced to the civilizations now. Boss had helped him with the transition. She had also wormed her quirky, eccentric way into his heart. He wondered what she would think of his rag-tag army. She had suggested part of it; the rest Lynda Rooney had cobbled together with some local help. But Boss wasn’t here to see how it all worked. Boss was far away, in another sector, trying to find more ships. Then Coop sighed as he caught himself in another lie, this time to himself. Boss wasn’t just looking for more ships. She was digging into a boneyard of Fleet ships they’d discovered a few weeks ago, hoping to find out what happened to his people all those millennia ago. “Do the ships see us?” he asked. “I have no idea,” Kravchenko said. “I can monitor their chatter,” Officer Kjersti Perkins said. She was his chief linguist, and had become one of the more invaluable members of his bridge crew. She could float from console to console, handling many of the problems that he didn’t even see. “If they won’t notice, go ahead,” he said. “I have no idea what they’ll notice and what they won’t,” Perkins said. He smiled. She could be very literal at times. “Do your best,” he said. He wasn’t sure whether or not he cared if the empire ships noticed. He had revealed his own ships days earlier. Initially, he had kept both the Ivoire and the other Fleet vessel, the Shadow, under a standard cloak. Standard for the Fleet, anyway. Even their simplest cloak was too sophisticated for the ships around him. Before Coop’s chief engineer had left with Boss, she had tried to build a simple Fleet cloak onto the Business. It hadn’t worked. Fleet technology didn’t blend easily with modern technology. Everything had to be adapted and modified, and no one had time for that. Not after the attacks on the Empire’s research facilities. Coop frowned at those ship images. The Empire had every reason to attack the Nine Planets Alliance. All of the Empire’s stealth-tech research facilities had been bombed or destroyed in the last two months. Coop had destroyed the main facility himself, although he initially hadn’t meant to. Boss had roped him into the attack, which she had believed would be a simple rescue mission. Coop knew from the beginning there was no such thing as a simple rescue mission, particularly deep in enemy territory. He had initially refused to participate. But Boss would have gone without him, and that might have been the end of her. He had decided at that moment that, after all of the losses he’d suffered, he couldn’t suffer another. He had gone with her. What’s more, he had actually planned the mission. He had kept Boss alive, but at a cost. One of those costs had been riling the Empire. He had known it was coming, but Boss hadn’t seen it. She wasn’t military, and she wasn’t used to dealing with a variety of governments. And much as she loved history, she wasn’t good at seeing perspectives other than her own. If Coop had been working for the Empire, he would have tracked down the ships and the attackers who had gone after the research facilities and destroyed them all. He suspected that the ships out there were doing exactly what he would have done in their place. They had tracked someone or something here. Maybe they had intel that had brought them to the border between the Nine Planets Alliance and the Enterran Empire. He knew these ships hadn’t tracked him across Empire space to the border, because the Ivoire and the Shadow hadn’t crossed regular space to get back. They’d used their anacapa drives, a technology that the Empire didn’t even have. The anacapa allowed ships to move from one place to another in a matter of seconds. When the anacapa worked, it was an amazing device. When it malfunctioned, it killed or—in his case—displaced the ship in time. Five thousand years of displacement. The Empire had no idea what an anacapa was. But it was conducting dangerous experiments with something it called “stealth tech,” which was a primitive form of the anacapa drive. The Empire believed that stealth tech was a cloak, and nothing more. And Coop would like to keep it that way. “Get me the specs on those ships,” he said to Officer Anita Tren. She was tiny and barely saw over a console. But she could gather information faster than anyone else on his current bridge crew. “We’ve been monitoring the information feeds in the Empire for a while,” said Second Engineer Zaria Diaz. Coop liked having her on the bridge when Yash wasn’t here. Diaz, who was as tiny as Anita Tren, had a talent for finding problems that no one even knew existed yet. “Cloaked,” Perkins said. She clearly didn’t understand it. “They’re trying to sneak into the Nine Planets?” Anita asked. The bridge crew laughed. He appreciated that too. It had taken a lot to scare his people six years ago. Ever since they came into this strange future universe, they rarely scared at all. They’d faced the worst, and survived it. He knew that some of them, even now, probably preferred death. His thoughts rested for a moment on his former first officer, Dix Pompiono, and then he shook it off. Dix had given up. It was one thing to die in battle, another to die by your own hand. Coop didn’t respect the second choice. “Shouldn’t we warn them somehow?” Perkins asked. “Warn them of what?” Coop asked. One on one, Coop’s ships outmatched theirs. Maybe even two or three to one. But two of his ships against fifteen of theirs, ten of them battleships in one way or another? He didn’t want to go through that particular match-up. “We’re not doing anything unless they cross that border,” Coop said. He only had pieces of a plan, not an entire plan. He hoped Boss would get back soon. He hoped she would have answers. He hoped she would bring back dozens of working ships. We skitter out of foldspace, and I look at the navigation screen on Nobody’s Business Two. We have arrived exactly where Yash Zarlengo said we would. Yash stands beside me, an athletic woman clearly raised in real gravity. Her thick muscles and strong bones make her seem larger than she really is. Or maybe it’s her oversized personality, or the fact that—against all odds—I’ve come to trust her. I rarely trust anyone. Even though I’m traveling with more than thirty people on the Two, I don’t trust most of them. I expect them all to do something wrong. I barely know some of them. But Yash both built and runs the anacapa drive in this ship. I might command the Two, but Yash makes sure we survive any trip we take into foldspace—a place that still makes all of us nervous. We’re not in foldspace now. Now we’re way outside of our sector with no backup whatsoever. We’re the only ship in a vast and mostly empty area of space. There’s a starbase half a day from here, but it’s not a friendly place. Besides, the last time we were there, we attracted some scavengers who wanted to steal our anacapa drive. This time, we’re hoping that those scavengers—indeed, anyone in this sector—aren’t somehow monitoring our arrival. Because we’re sitting outside the Boneyard. The Boneyard is the largest ship graveyard I have ever seen. And the sad part about it is that it looks like the majority of the ships inside come from the Fleet. None of us knows how those ships got here, and none of us knows why they’ve been left here. That’s what my team and I are supposed to find out. I’ve got my divers. I’ve got Yash. And I’ve got soldiers to protect me, not just from the scavengers, but from anyone else who might be nearby. I hate traveling with all these people. The Two is bigger than my original ship, Nobody’s Business, and smaller than Dignity Vessels like the Ivoire. But I’ve never traveled in a ship nearing its maximum capacity of passengers, and I hope I never do so again. I’m a loner, even though I’m running a major corporation now, and like most loners, I truly prefer to be alone. That’s why wreck diving suits me. Why it has always suited me. I was actually looking forward to this trip until the passenger list grew. Then I realized I was responsible for all of these people in one way or another, and they would be crowding the narrow corridors of the Two, and I’ve been annoyed ever since. Well, not annoyed. Not really. Tense. I can’t tell anyone how very worried I am. I wipe my hands on the sides of my pants. My palms are actually sweating, which happens to me only when I’m extremely nervous. I like to blame my nerves on the fact that the entire cockpit is filled with people, but that’s not the whole story. Still, the crowd isn’t helping. The cockpit is built for twelve, and we have fifteen in here, not counting me. Everyone who hasn’t seen the Boneyard wants to see it right away, instead of waiting for the mission brief. We couldn’t fit everyone who hadn’t seen the Boneyard into the cockpit, even though Yash kept inviting more and more, until we’re now squeezed. She has no real idea how uncomfortable crowds make me. She knows I’m a loner, but she thinks that eccentric, something I turn on and off, like a smile. She doesn’t realize that a lot of people disturb me on principle. She never had the choice to be alone. She grew up in a society based on crowds. From what I can tell, the Fleet built space into their ships for people to have privacy, but those same people could choose from their childhoods on to be with others, and most did. The very idea makes me shiver. Just like standing in this cockpit makes me shiver. There are people behind me that I can’t see, and that drives me crazy. I could order everyone away, but I don’t. This is a momentous occasion for a lot of the people here, and they really need to see what’s before them. My divers, on the other hand, aren’t in the cockpit (except for Mikk, who is at the helm). My divers are used to me. They understand my needs and probably share them. Besides, my divers know they’ll be seeing the Boneyard soon enough. They’re in the briefing room, studying what little information we got on our previous trip, and waiting for me. We sort of lucked into the decision to keep the divers out of the cockpit. They chose not to come, and the others begged to join us. Silly me, I didn’t speak up when Yash said yes. She does want them to see everything. And she really isn’t paying attention to moods. Technically, I should do that. Just one of the many things I’m not suited for as captain of a large ship. Not that I have the official title of captain, nor is this a large ship. It’s my current diving vessel, and circumstances brought the crowd along with us. Circumstances and the damn anacapa drive. I keep thinking I’d’ve been calmer if I hadn’t gone into foldspace—if all of us hadn’t gone into foldspace. Foldspace makes everyone nervous—particularly the borrowed crew members from the Ivoire. Foldspace is exactly what it sounds like—at least that’s how everyone explains it to me. They compare foldspace to a fold in a blanket, which tells me they’ve all been briefed the same way as well. They even begin with the same phrase: foldspace provides a shortcut in space. Then they expand, using the same example. Say you want to go from one part of a blanket to another. Rather than travel the entire length of the blanket, you fold it, and both parts touch. That’s how foldspace works. Plug in the coordinates from where you are and then add the ones from where you’re going, activate the anacapa, and it’ll fold space the way that we would fold a blanket. Only now that I’ve been to foldspace a few times, I know the analogy isn’t quite accurate. We don’t immediately leap from one spot to another. We actually pause in foldspace. We stop there for a minute or two. Each time I’ve done this—which is more than I’ve wanted to—I’ve seen a different star map inside foldspace itself, leading me to believe that foldspace isn’t so much a fold or a shortcut or points on a damn blanket as it is a different place altogether, one with its own stars—and maybe, its own people. I have not discussed this with Yash. She’s a fantastic engineer who understands more about the anacapa drive than anyone else I know. She’s also very no-nonsense, and refuses to talk in hypotheticals unless she believes it will get us somewhere. I’ve heard her discuss foldspace—mostly to dismiss the nerves that the Ivoire crew members still feel. The Ivoire got stuck in foldspace for two weeks, and then appeared in our universe, in what had been a familiar place to them. Only they were five thousand years in their own future. It’s taken a lot of adjustment for the more than five hundred members of the Ivoire’s crew to realize they’re stuck here, in a universe that only seems familiar. Some crew members have killed themselves. Others have left the service altogether. The remaining ones divide into two rather loose groups: the ones who believe they can return to the Fleet and the past (which most of them still think of as the present) and the ones who have accepted that they now live in what they once considered an unimaginable future. Yash is one of the realists. She believes that she’s stuck here, in this time period, for the rest of her life. That doesn’t stop her from seeking information about what happened to the Fleet, but it does make her much more willing to take risks here and now. She has also settled in. She looks at the rest of us as colleagues instead of people she will only know briefly. It’s been more than five years since the Ivoire arrived. I think Yash’s perspective is the correct one. But who am I to say? I’ve dealt with the Ivoire crew, but I can’t begin to understand the extreme dislocation that they’ve suffered. Right now, Yash is as nervous as I am. Normally, she would sit at her newly built station as we traveled here from the Lost Souls Corporation deep in the Nine Planets Alliance. But she stood through the foldspace transition just like I did. But I’m the only one who knows that her nerves came not from being in foldspace like almost everyone else’s on board, but because she wasn’t entirely sure where we’d end up when we emerged from it. And she wasn’t worried that we were going to the past or some unknowable future. She was afraid we’d end up inside the Boneyard itself, maybe on top of, or inside of, a ship. Even though I had recorded the coordinates the last time we were here—the only time we were here—she didn’t believe that I had done so accurately. She spent a lot of time running diagnostics on the Two’s entire system, making sure we were being accurate. She’s a worrier, although everyone says that part of her personality is new. There’s a lot of new to deal with in my team. This is the first time I’ve mixed members of the Ivoire with members of my own diving team, and done so without Coop on board. In the past, Coop has always kept his own people in line, and I’ve taken care of mine. We’ve run joint missions before, usually to great success. I’ve just never done so on a diving mission, which is nothing like anything the crew from the Ivoire has ever done. “Let’s open windows all over the ship,” I say. Yash looks at me sideways. I don’t give commands in the proper language, at least for the military-trained Ivoire team members. Even now, even after knowing me for five years, they still are uncertain when I’m telling them to do something or simply making a suggestion. I can rephrase, I suppose, but before I do, Yash nods. Joanna Rossetti, another of the Ivoire’s best people, nods back. Rossetti is at the helm, partly because she can handle the anacapa augmentation on the Two’s piloting system with no problem, but also because she is great in any surprise situation. She’s had my back more than once, and I’ve been grateful for it. She activates the controls that reveal the windows all over the ship. The ones in the cockpit go from dark to clear, revealing the Boneyard in all its glory. And glory is the word I mean. I love graveyards. I always have. Even land-based graveyards, which are, if I think about it, disgusting—bodies decaying in dirt, bugs, skin sloughing off bone. I’d rather have my body sent out into deep space, spinning forever in the starlight. But that’s too irreverent for me to say. I’ve never admitted it to anyone, not even Coop, who has become the closest thing to a confidant that I’ve had in decades. I certainly won’t tell him that I find the Boneyard beautiful. He looked at it only once—the day we discovered it—and found it terrifying. All those ships from the Fleet, hundreds of them, maybe thousands, filling an area so large that it’s bigger than some asteroid belts. It might even be the size of a small solar system. We have yet to measure it. The old spacers who told me about it on the starbase Azzelia a few weeks ago said it was the size of a large moon, but what we have seen shows that they significantly underestimated its size, just like we did when we first saw it. The Boneyard shows up as an emptiness on a star map, which freaks navigators out. It disturbed me the first time I saw it, and I’m still not sure how that’s done. Because it should show up as a ship graveyard. It doesn’t. It shows up as a blackness, a nothingness, in space itself. I suspect some of that star map blackness is the energy field around the Boneyard. But some of that star map blackness is custom. On the old star maps, the Boneyard showed up as a black nothingness because no one could penetrate its borders, so it was a great unknown area. Back then, unknown often showed up on star maps as blankness—or blackness, given how the maps were designed. That black emptiness, at least as it pertained to the Boneyard, got transferred to modern star maps. When we went back to the Lost Souls Corporation after finding the Boneyard for the first time, we researched the Boneyard. Or we tried to. I have dozens of researchers of all types on staff. Those people know how to find any detail, if it’s available. Coop and Yash and members of the Ivoire did their best combing what Fleet records they had from way back when. They also set their best science team on the readings we picked up from the Boneyard itself. 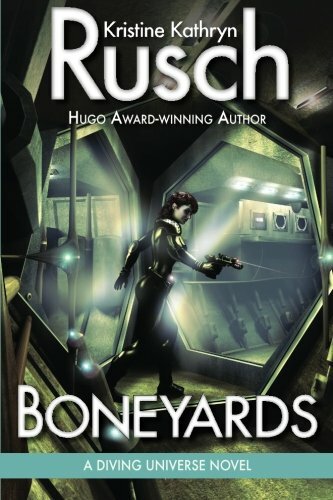 We know this: the Boneyard, its force field, and its ships have been here for a long, long, long, time. Maybe the full five thousand years that the Ivoire lost. That’s all we know for certain. We can only make educated—or maybe not so educated—guesses about the rest. Coop’s convinced the Fleet that he spent his life with, the Fleet he was born into, had fought a huge battle here. He hasn’t said, but I know he believes that this battle was devastating, and the Fleet lost. He thinks the ships are from that battle, and he believes that they constitute the bulk of the Fleet at the time—maybe even the entire Fleet. He worries that the Fleet got destroyed shortly after he left, and everyone he knew died in that hideous battle. I know better than to remind him that everyone he knew then has died thousands of years ago. A careless member of my staff made a similar comment early on, and the cold, dismissive look Coop gave her hid the pain her remark had caused him. If I had to guess, I’d say that Coop prefers the idea of the Fleet being destroyed in a battle that he can research and understand than the idea that the Fleet continued without him, heading into the vast unknown of space on missions he’ll never know about. Because he’s usually an evidence guy. And the evidence we have so far points to something far different than one battle. First of all, the size. The Fleet was large, but not so large that its final resting place would take more space than a small moon. Secondly, the only ships that we can see in the Boneyard are Fleet-made. If the Boneyard had been a former battlefield, there should be other ships inside it, ships from other cultures. And then there’s the type of ships. Yes, the Fleet was huge. But the ships here don’t look like the images of the ships I’ve seen on the Ivoire. They’re Fleet ships, but they don’t seem to match the ships that Coop and his crew left behind. Some look like the first Dignity Vessel that I found long before I met Coop. That ship had a completely different construction, with actual rivets holding parts together, something the Fleet of Coop’s day hadn’t used for centuries. I’ve mentioned that, and Coop says I remember it wrong. I don’t mind the dismissiveness; he never saw that ship, so it’s not real to him in some way. But I’ve also told Yash, and she asked to see the specs. I’ve shown them to her. They made her very, very quiet. That disturbed me more than Coop’s inability to listen. The structure of some of the visible ships inside the Boneyard looks more like the structure of that first vessel than it does any of the Dignity Vessels from Coop’s era. But we haven’t been able to go inside to see for certain. And I’m not going to come to any conclusions until I have gone into that Boneyard. Because I’ve learned, through countless dives of countless wrecks, that assumptions only get you in trouble. The more you assume, the more you search for whatever it is you’ve decided you’re looking for. That’s one of the many reasons I’m relieved that Coop has stayed behind. He would approach this dive so very differently, and I’d be afraid that he’d infect my crew. For this very reason, only my people will dive the Boneyard. We know very little about the Fleet—especially compared with the Ivoire crew. We won’t make assumptions based on a shared past. We’ll make our own set of assumptions, some of which will happen because of our ignorance of Fleet technology, but Yash will help with that, at least. Although I do worry about having Yash on this mission. I need her because I can’t operate the anacapa without her, but I don’t want her talking to the dive team. In fact, when I briefed her on this trip, I made her swear that she wouldn’t talk about the dive mission at all. It was a dicey moment, because technically, I’m not her commander. Coop is. He still maintains his captain’s rank, hoping to return the Ivoire to the Fleet one day. His crew—what remains of it—acts under that assumption as well. Technically, he has loaned the Ivoire crew members to me for this mission—the engineering staff to protect the Two and my team, and the soldiers one level below. Soldiers. If you had asked me years ago whether or not I’d allow soldiers on a diving mission, I would have laughed at you. But Coop and I ventured into the Empire’s territory a month ago and attacked them. We had a very good reason, but we knew that attack would have consequences. Those consequences include soldiers on every voyage Coop, I, or my team takes. Those consequences have also given this mission even more importance. The more operable ships we find, the more we can use them to defend the Nine Planets. But I’m getting ahead of myself. We have to get inside the Boneyard first, and that might not be easy. The Boneyard has a force field around it, a field we had only begun to analyze on our first visit here before we got attacked. We’re hoping that the field is a modified anacapa field, but we don’t know for certain—and that’s another thing that worries me. I’ve had friends and relatives die because of malfunctioning anacapas. At the time, we thought it a strange energy form—we had no idea what it really was. The Ivoire’s crew has reassured me countless times that my crew is fine around a working anacapa, that it’s only the malfunctioning ones which cause a problem. Yash tells me that my team will be safe no matter what; she will make certain they’re nowhere near malfunctioning anacapa drives. I hope she’s right. I’ve brought a few of my most trusted team members on this trip, but they don’t have the genetic marker that enables them to survive inside a malfunctioning anacapa field. Every member of the team that will dive with me has the marker. Although, as I stare at the Boneyard unfolding before me, I realize that I’ve been lying to myself. Of course I’m taking chances. I’m taking terrible chances. I’m taking the chance that we’ll all get discovered here by the scavengers who attacked us the last time. I’m taking the chance that we can actually get into the Boneyard. And I’m taking the chance that we can get out. Maybe it’s because I’m older now and more experienced, or maybe it’s because I feel the weight of all these lives around me. But I’m much more aware of what can go wrong and what the costs are. I’m also aware that the Boneyard will answer a lot of questions, and maybe, just maybe, it’ll help us stop something I’ve wanted stopped for decades. It might provide a way to stop the Empire from expanding, from taking over the entire sector, and yet another sector after that, and another sector after that. Whatever we find inside this Boneyard might just save us all. “I didn’t expect it to be amazing,” someone says behind me. I don’t turn around. I step back and look away from the screens, most of which show the Boneyard as a gigantic unrelieved blackness, and look out the windows as best as I can. I have to look past several heads. People turning to each other, people whispering, people cupping their hands over their mouths in awe. They’ve seen it. They can leave now. I think that, but I don’t say it. Instead, I move just a little so I can look out the windows. All I can see are bits and pieces of the Boneyard. It’s bigger than I remember, more vibrant. The ships almost seem like they’re in motion, which they probably are. Nothing stays completely still in space, but the movements are usually microscopic. I’m not sure if my sense of movement is a trick of the mind or something to do with that force field. The ships have my attention now. They float, in various stages of ruin. Some seem just fine; others have gigantic holes where their bridges should be. Still others are missing wings or the tail section or the underbelly where, on most large Fleet ships, the family members live. Some ships are just underbelly. Or just wings. Or the sides of a ship without any interior at all. I itch to go inside any of those ships. All of those ships. I have missed diving. All of this corporate stuff—setting up the business, organizing a large workforce to modify Fleet technology to the modern age, working our patents and trademarks, doing our sales, and building our own small group of ships—takes time. I run an organization bigger than any I’ve ever belonged to, and I hate it. Well, that’s not entirely true. The hate part is true. The running part is less true. About a year ago, I passed the day-to-day operations to Ilona Blake, and she handles the personnel, the decisions, the conflicts. I still steer—I’m not going to let Lost Souls, despite its name, become a soulless organization. I’ll do everything I can to prevent that. That’s something I care about. But I’m passionate about diving. I just forget that sometimes. So much else happens—I start a business, I deal with people, I ignore regulations. I’ve been deeply wrapped up in the Ivoire and Lost Souls. But my heart belongs to diving—going into the unknown, learning about a ship, learning about a past. Exploring what remains. Realizing that, no matter what happens to me on a day-to-day basis, it will be forgotten a year from now, and it won’t matter to anyone else a century from now. No one will exactly be able to piece together all the bits of my life. As a loner, that gives me comfort. As a lover of history, it gives me a sense that I’m part of something greater than myself. As a diver, it lets me feel closer to the unknowable past. Outside of this ship, behind a force field we don’t entirely understand, lie more ships to dive than I’ve dived in years. Maybe more than I’ve dived in my lifetime. Part of me wants to stay here forever, go from ship to ship, learn about each one, and die decades from now with most of the Boneyard yet to be discovered. But I am here on a mission. I dive for Coop and the survivors of the Ivoire. I want to let them know what happened to their Fleet, if I can. And I want to get technology for Lost Souls. More ships, more equipment, more knowledge. Those are the stated goals. But for me, the unstated goal is the most important goal. I want to return to my roots. I’ve missed being alone in near-dark in a place I’ve never been before, trying to figure out where I am, what I’m doing, and how I will survive. I thrive on adrenaline, and diving has always given me that rather startling rush. That adrenaline rush is actually something I need to be careful of. My old diving partners would remind me of that each time we went out. One of them would monitor me while she waited on the skip, so that I wouldn’t use my oxygen more quickly than I needed to. She’s dead now. Many of my diving partners are dead. Or retired. Or they’ve vanished. The original crew exists only in my head. But oh, how we would have loved this place. We would have dived it without a thought to war or the future or discovering someone’s past. We would let the wrecks tell us their secrets without prejudging them at all. I have never wreck dived for money—real dives, historical diving. I’ve taken tourists to old wrecks so I could afford my other trips. Trips that were mostly for me. I often did not report the historic wrecks I found. I let them remain, their history intact, taking from them only the information which they wanted to share with me. All of that ended, of course, when I discovered my first Dignity Vessel—and that put me on the path that led to the Ivoire. To here. “I’m still stunned at how big this place is,” Yash says softly. She sounds unnerved. Maybe she is. We’re about to get answers. They might not be the answers she wants, but we’ll get some. “Can we count how many ships are in there?” someone else asks. Even though I’ve been introduced to these people more than once, I can’t remember their names. Maybe I don’t want to. Maybe part of my brain is happier if it is less crowded than this cockpit is. “Some of us have nothing to do at the moment, Boss,” Mikk says from his position at the helm. He’s learning how to work the new Two controls. He’s one of my best people. He has been with me for a long, long time. He’s much more muscular than most divers, and always uses special suits. But those muscles have helped us when we’ve been on land-based missions, gravity-filled missions. He’s helped me in more ways that I can say. Yash has the important job. She needs to figure out what that force field is made of and whether or not we can breach it. We can use the anacapa to go inside the Boneyard, but if the force field is active inside as well, then we might encounter a problem. Differing energy fields might interact and create problems like we once encountered with the malfunctioning anacapas, or the fields might repel each other. Plus we don’t know what the force field will do to our skip or to the Two herself. Or to our diving equipment. And then there’s the matter of the ships inside the force field. They might still have active anacapa drives as well. Yash and I have gone through countless possibilities, and I know she’s gone through even more than I have, because at a certain point, my brain just turned to mush. I figure we need to know what we’re facing, and then we deal with it. It’s Yash’s job to get enough details so that we will know whether or not we can move forward. “You can count all you want,” she says to Mikk, or maybe she’s speaking to me. She thinks I’m asking about figuring out how many ships are inside the Boneyard. I was referring to the Boneyard herself. She sounds distracted. She doesn’t care what we all do, as long as we leave her alone to finish her job. I’m not sure how far along she is on this job. “How many people do you need to work on the force field?” I ask quietly. I nod. I know better than to ask her how long this will take. Her answer would sound like an answer I would give the crew: It’ll take how long it takes. Even though Coop wants answers yesterday, and even though we need more ships for our upcoming fight with the Empire, I’m trying to run this trip the way I would have run a dive in the old days: We’ll be here until we’re done. I find that exciting. And liberating. And frightening. Because I haven’t lived like a diver in nearly a decade. I’m out of practice. And I know I have to get my head on straight before I can lead a team inside that Boneyard. I have to think like a diver, not like a corporate executive or a woman who’s worried about a war with a much larger power. I have to think like the old Boss, and I haven’t been her for a long, long time. Here’s how you find the rest of the book: You can order the trade paper copy of the book online or through your favorite independent retailer. (Powell’s has copies which you can find here.) The ebook is widely available, on iTunes, Kobo, Amazon, Barnes & Noble, Omnilit, Smashwords, and more. You can also get an audio edition from Audible. Enjoy!